When reading the story of how I learned English, you have to remember a few things. In 1993, when I was starting to learn English on my own, no one had heard about the Internet. I couldn’t read blogs, forums and other websites on topics that I found interesting. Frankly, I have no idea how I knew which movies to see without Roger Ebert’s movie reviews. And how did I learn about the latest computer technologies, such as the Intel Pentium processor and Windows 95? I really don’t remember. My written input was practically limited to books, and I could not even order them from Amazon. Who would order books from the Brazilian rainforest, anyway? All I had were a few shelves in two or three bookstores, the British Council library at the local university, plus whatever I could get from my cousin Chris, who lives in America. You may think it wasn’t so bad, but when I was preparing for an English competition in high school, I remember I had major problems finding good resources on the history of England and the United States. You have no idea how poor Wikipedia was back in 1996... oh, wait, actually it did not exist at all. For spoken input, I was basically limited to watching the war in Yugoslavia (CNN International & BBC News) and Bugs Bunny (Cartoon Network) on my cable TV. “What about movies?”, you ask. For one thing, nobody used DVDs, and it wasn’t because they downloaded movies from P2P networks. People bought and rented VHS tapes. In Poland, every movie on VHS had Polish dialogues and there was no English soundtrack to switch to. The only way I could watch a movie with English dialogue was if I went to the cinema (movies in Polish cinemas are shown in English with Polish subtitles; don’t ask me why). I was a big fan of The X-Files, but I could only dream of watching it in English. Preparing to paste an example sentence from the Random House thesaurus into my SuperMemo collection. Dictionaries were just books. Software dictionaries were a novelty. When I finally got a PC dictionary from a classmate (I think in 1994 or 1995), it was a Random House dictionary for native speakers that came on six floppy disks. (Yeah, there were CD-ROM’s, but there were no CD burners.) It had unfriendly definitions and few example sentences. I loved it because I could look up English words much more quickly and I could open it from inside SuperMemo with a special hotkey to copy & paste definitions and examples. Today, you can get learner’s dictionaries from Oxford, Cambridge or Collins that have simple definitions and lots of example sentences. They also take up 100 times more space and run more slowly, but that’s life. ...I would spend a lot of time on the Web. Hours and hours every day. 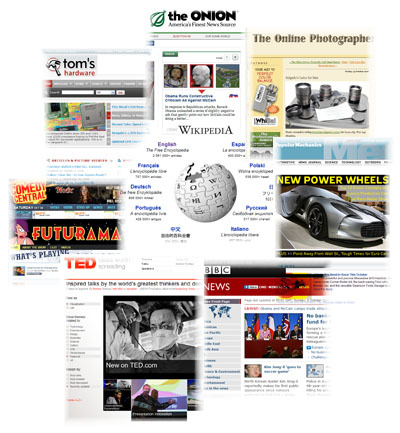 I would read websites on my favorite topics: computers, science, philosophy, photography, politics, web design, marketing, etc. I would download movies, series, cartoons, documentaries, and video lectures. I would watch funny clips from American talk shows on YouTube. I would listen to podcasts on my iPod. I would learn how stuff works. Yes, at first it would be hard to understand real-life English. But I would have at least two advanced learner’s dictionaries on my PC. I would spend a lot of time looking things up and I would probably add lots of example sentences and phonetic transcriptions to SuperMemo, at least at the beginning. So, if I were learning English today, I believe I would get much more input more quickly. It would probably be more authentic input — less literary English from novels, more everyday English from blogs and discussion forums. In English classes, perhaps I would use a laptop with a few dictionaries and SuperMemo on it. Maybe I would be able to add new words on the spot instead of writing them down and adding them at home. Perhaps classes would not be such a waste of time then. I’m sure I would also have more opportunities to produce output. My friend Michal and I would be able to e-mail each other in English much earlier. I would be able to post questions and comments on discussion forums and blogs. When writing, I would use Google to check the correctness of my sentences. That would help me to eliminate mistakes and pick up new phrases. I would be able to see which phrases are actually used by native speakers, and which are purely literary. Sometimes I think that if I had had the Internet, I would have become a fluent speaker in one year instead of three! Find it on the Internet in English. Try to get as much English as possible out of it: When you read a sentence, treat it as a lesson in how to say things in English. Pause and think about it. Imagine yourself saying it. Make up a similar sentence in your mind. Look up pronunciations and examples in dictionaries. Repeat the above every day or almost every day for at least 30 minutes.